Above is a graphic from wikipedia.org showing the keyboard layout we’re trying to create. Note that only the central portion of the keyboard is different. About half of the keys will remain right where they are. 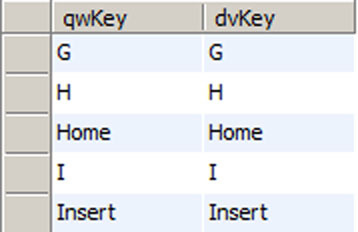 In this post, we’re going to take a look at how I went about detecting errors in my keymap data. Any problems we can eliminate early on will be problems we don’t have to deal with later and the database makes this rather easy to do. Again, the only thing that should show in the results pane are the columns: 1, 2, 3, 4, 5, 6, 7, 8, 9, 10, 13, 14, 15, 20, 23, 24, 25, and 26. If you take a look at a qwerty keyboard and then compare it to the graphic at the top of this post, you can see that where there is a G in a qwerty layout, there would be an I in the dvorak layout. The Home and Insert keys would remain in their same position in both layouts. This query puts the key translation into the where clause of the query, which makes the result set show if there are any inconsistencies. At the end of the day, each key can only be represented once for each layout. The forwards and backwards examination of that translation should be consistent. If any problems do show up, you have an opportunity to debug it now before we’re about 500 lines deep in verilog code. Next time, we’ll take a look at how we’re going to implement the key translation. That post will be mostly about the theory behind the design. Do note that if you’re not comfortable with sql queries, it might seem to get a little bit more complicated from here, but we’ll really only be using the same multiple-joins trick in a slightly different way. This entry was tagged DasDvorak. Bookmark the permalink.